Does The World Need Another Brand Of Coffee? So there you are product manager, sitting on the top of the world in charge of the #1 selling brand of coffee and you’re pulling in something like $4 a cup. Then all of a sudden: blam! The global economy falls off a cliff and suddenly there are a whole bunch of competitors who start to poach your customers by offering premium coffee at a much lower price. What’s a product manager to do? Everyone knows about Starbucks coffee – it seems like there is a Starbucks store on every corner right now and new ones seem to be popping up all the time. Well, according to the Starbucks product managers, that’s not enough. Lately McDonald’s, Dunkin Doughnuts, and just about every other fast food chain out there have started to offer espresso-based coffee products. Oh, and they’ve been doing it at prices that are lower than Starbucks. The Starbucks product managers have seen this happening, but they have been constrained from doing anything because by necessity Starbucks has a limited menu (in order to keep things moving quickly) and the majority of their business is done in the morning. While all of this has been going on, the number of Americans who drink premium coffee has increased. In fact, in just the last three years alone the number doing so has jumped from 29% to 35%. Great, so what’s a coffee product manager to do? Seven years ago Starbucks bought one of their competitors: Seattle’s Best Coffee. They haven’t done that much with them since then, but thanks to the Starbucks product managers that will soon be changing. Starbucks plans on rolling out a second coffee brand, you guessed it, Seattle’s Best Coffee. This is the brand that they are going to use in order to compete with the lower-priced fast food coffee offerings that have been nipping at their heels. This is where the real product management innovation will occur: this new brand is going to be sold everywhere. That means that you’re going to start to see it in about 30,000 different locations ranging from fast-food outlets, supermarkets, bookstores, and even vending machines. I can almost hear some of you starting to mumble concerns about this approach. You’ve got a good point. Since Starbucks is going to be selling most of the Seattle’s Best Coffee through franchisees they are going to have a significant quality control issue. Additionally, the coffee that is sold though vending machines is generally the worst coffee out there – what is Starbucks thinking? The product managers at Starbucks point out that they really don’t have all that much to risk. Right now Starbucks has less than 4% of the U.S. market for brewed coffee. There’s no place to go but up. Additionally, the engineers at Seattle’s Best have created a new type of vending machine that they believe can actually deliver a good cup of coffee. Starbucks finds itself in a difficult spot: it’s got the #1 selling coffee product; however, the competition is coming on strong. The product managers at Starbucks realize that if the competition is successful at taking away the lower end of their customer base, then there will be nothing to stop them from moving up and capturing more and more customers over time. 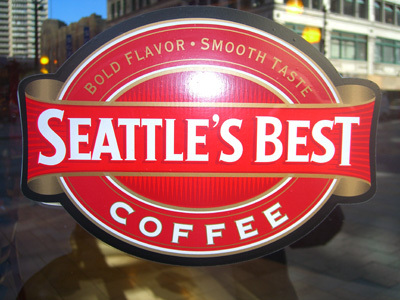 Starbucks is taking the novel approach of launching another brand: Seattle’s Best Coffee. They hope that by distributing this product everywhere they will be able to take some of the wind out of the sails of their competition (and money out of their pockets). Question For You: Do you think that Starbucks should have just lowered their prices to keep more customers?